Daisy Dew was a great deal of fun to compose, especially after I decided to include her sister cats who prowl around the guileless, ingenuous (and perhaps simpleminded) Daisy in conspiratorial mode. I also loved adding the bicycle built for two and some daisy flowers. Dog art can have great gravitas due to the beautiful nature of all pups, but should be fun as well. Not able to choose the best angle on dear Daisy, I decided to present a dual portrait with both full front and side views of her head. Daisy can be zany, but then in an instant can turn to you with an earnest, inquisitive expression. She just may be a dog of depth, after all. This art was featured in the 2013 Art Show at the Dog Show in Wichita, Kansas. 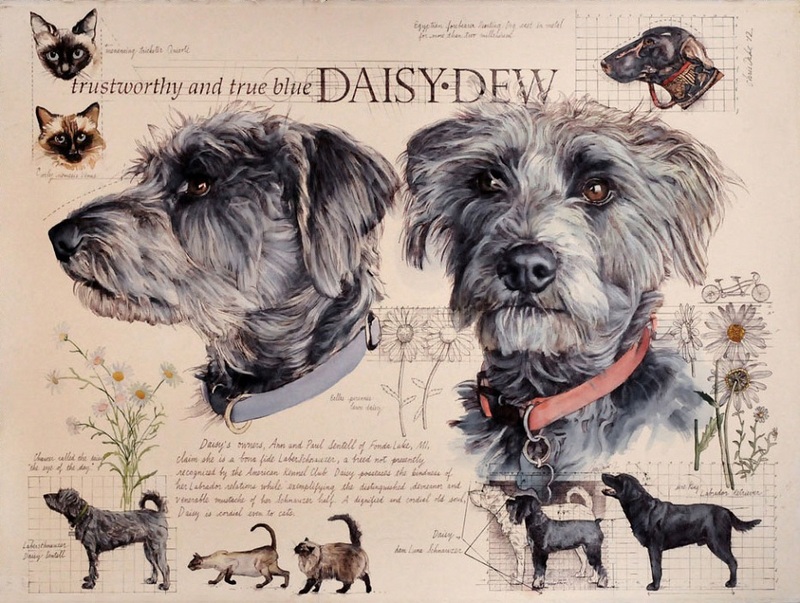 Daisy’s owners, crazy about the piece, have hung it on the wall between their living and dining rooms so that it graces both spaces.